…I worked on my novel. Which looked kind of like doing Internet research on ships. I found one that might end up in my final draft. 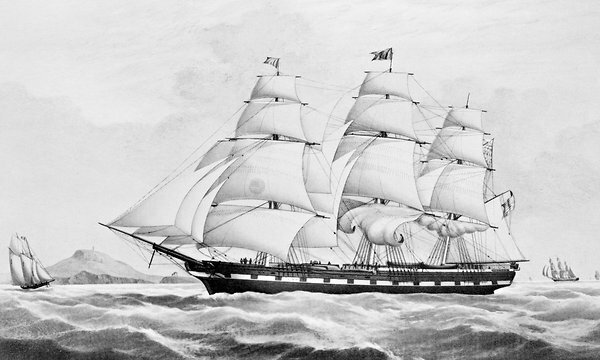 It was known as a packet ship of the Black Ball Line, active from 1817-1878. Cool, huh? Fast, spacious, well-armed. I won’t tell you what it’s for, but let’s just say it’s making a cameo in this book so it can possibly reappear in the sequel. Ellie took the pen and let it hover above the page. Fill the words with light. Where on earth to start? She closed her eyes, remembering the story. Instead of curly black letters, she saw sailors fleeing from giant waves, a salty hurricane of spray overwhelming them. But then the clouds broke, and the white gull came wheeling down in a shaft of late golden light. The fearsome waves were turned to turquoise mountain peaks, capped with snowy foam–and gilded with light like the Legend in her visions. She dabbed her pen in the dish of blue ink and began to draw. Getting excited? So am I. I’ve only got about 45 pages left to revise! Ooohhhh…can’t wait for the unveiling!! Can’t wait to read the finished product 😉 Your #1 Tia! !